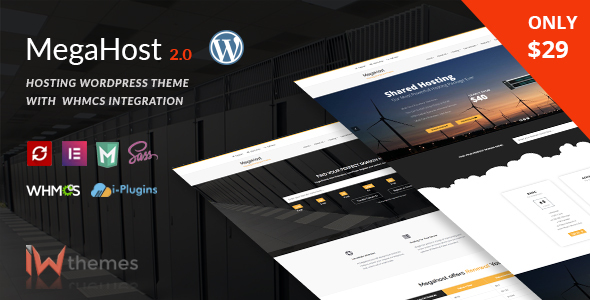 MegaHost is a great theme of WordPress. 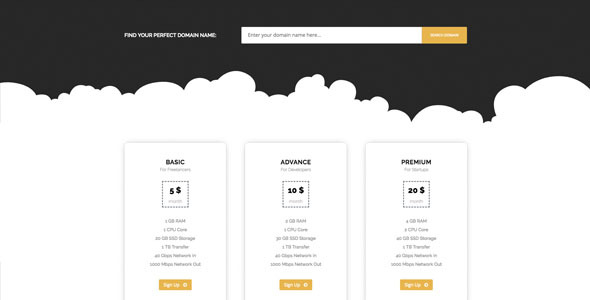 Specially created for hosting and technology sites. 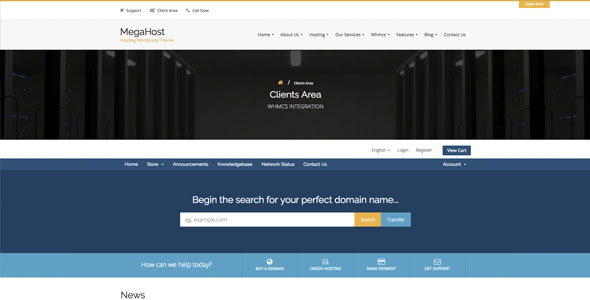 It offers a unique and original 100% integrated design with WHMCS (leading platform in the sale of hosting), integration is done through the WHMCS-BRIDGE plugin. Our theme has been completely developed from scratch, thought to satisfy the needs of our current and future clients, we have integrated 100% our theme with the wonderful page builder “Elementor”, with which basic users or developers will be able to create and combine different options of Design and customization. 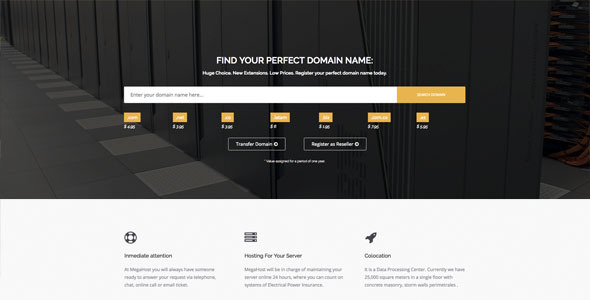 Whmcs is the leading platform in the management and sale of hosting, we offer a clean and 100% functional installation with this great software through the WHMCS-BRIDGE plugin. WordPress LIVE Theme Customizer (Updates In Realtime): The Customizer with easy navigation and dozens of theme elements, select hundreds of amazing fonts, apply many pattern backgrounds and setup different theme setting and skins. Live Page Builder For WordPress included: Elementor plugin with frontend and real time editor. With this drag & drop layout builder you can structure the content on your pages without ever having to touch a line of code,Comes with multiple predefined contents for you to use easily. Slider Revolution supported: The award winning Revolution Slider is supported and included ($25 value). This beautiful responsive slider allows you to create stunning effects for your site. ^  It developed completely from scratch. -  Removed widget login, to support. +  Add widget login, to support. #  Fix "alt" title for images. + add carousel ( sponsors, facilities, stories). + add icosns svg awesome 4.1. # just have added some lines of code in  the styles of the dark version. + Add Left sidebar and right Sidebar in blog page. + We added Carousel sponsors. + We added Carousel Facilities. + We added Carousel Stories. + We added reseller page. + Add Domain search function. + We add cloud page. + We add 5 Skins (Default, blue, yellow, green, red). + Add option logo  image. + Add import demo content. # Fixed issue with users login. + They added an html version in the download package. ^ Improved documentation for initial settings! + Full Integration with whmcs. # Correction items price tables. # Correction Number of price tables. # Correction Number of Members in about.